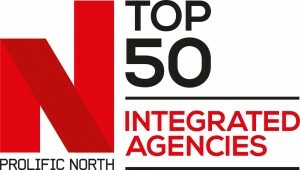 We're very pleased to announce the return of our agenda-setting initiative, The Prolific North Top 50 Integrated Agencies. Due for publication in November, the 2016 ranking will again benchmark the North's leading integrated agencies, spanning a huge range of advertising, marketing and creative businesses. Last year's Top 50 has proven to be exceptionally well read, and is currently one of the leading results in Google for the phrase integrated agencies. McCann Manchester came out on top in 2015 for the third successive year, with other Manchester agencies WRG and Havas Lynx taking second and fourth respectively. There was another good showing for Yorkshire agencies however, with Jaywing, Home, Brass and Intermarketing all inside the top seven. This year's top 50 will be the latest in our popular series of sector rankings, following the Prolific North Top 50 PR Agencies, Prolific North Top 50 Digital Agencies and Top 100 Brands. We're very pleased to report that, for a fourth year on the trot, Better Placed is sponsoring. And we've again partnered with Mustard Research to compile the Top 50 ensure the process is rigorous and the results entirely independent. As usual, we will be drawing upon financial data provided by the financial reporting company BVD Fame. As with our other Top 50 rankings, the Prolific North Top 50 Integrated Agencies 2016 will be predicated primarily by financials – balance sheet value, turnover and growth (both volunteered from the agencies themselves as well as corroborated online with Fame financials). It will also feature other key bits of information such as headcount and key client wins. Jo Iaconianni, at Mustard, will be emailing over 130 agencies in the next few days with the information that we have already compiled, before we start whittling the list down to 50. If any agencies wish to ensure their information is included at the outset, please email Jo at jo.iaconianni@mustard-research.com by October 28th.